Evelyn Ng was born in Ontario, Canada on September 14, 1975. She lived most of her life in Canada, where she honed her poker playing skills. She did not begin by playing poker; instead, she was a good pool player. She would often go play for money at local pool halls. She started at the age of 14, but by the age of 17 she was moving on to bigger and better things, poker and blackjack. She became a dealer for those two games, and at the same time she would learn to better her skills at both too. She started dating fellow Canadian poker player Daniel Negreanu around the same time. It was with his help that she managed to improve her poker playing abilities. He even helped her develop a playing style that was designed to oppose aggressive poker players. Bringing her own flair and sexiness (known as one of the poker babes out there in the industry), she set off into the world of professional poker. Although starting at an early age, she really gained her fame in 2003. She participated in the 2003 World Poker Tour circuit, playing in the Ladies’ Night I tournament. She managed to take second only after getting beat by Clonie Gwen. During the poker tournament she overpowered several top-notch female poker pros including Annie Duke, Kathy Liebert and Jennifer Harman. She has also participated in the World Series of Poker, but she has been unable to get to a final seat in order to win a bracelet. With her playing style and how she carries herself, it will be no surprise if she ends up winning her first bracelet any time soon. Apart from playing in live tournaments, she also participates in online cash games and tournaments. She has played in tournaments sponsored by PokerStars and Bodog (which was the last poker site sponsoring her at the time along with a few other poker babes and professionals). Even though Evelyn NG has been playing poker professionally for a short time, she has been gaining a lot of fame from her endeavours. Soon after placing 2nd at the 2003 WPT tournament, she was recruited by PokerStars, which have the reputation of going after new poker pros that have a lot of potential. After being a member of the PokerStars team for a while, she decided to leave and join up with Bodog. She was a part of the Bodog team until recently when they had the gambling debacle with the US government. As of late, she is no longer part of any online poker site. Evelyn has had several television debuts. She was in the hit TV show, King of Vegas, which is part of SpikeTV. She has also had some air time on a British show called Casino. She tried her luck against Chris Angel on his TV show, Chris Angel Mindfreak, when he tried to persuade Ng of picking the losing hand out of a set of cards. She was even included as a character in Daniel Negreanu’s video game Stacked with Daniel Negreanu. The main reason she got to be so famous, and good at playing poker was her playing style. She was taught early on by poker pro Daniel Negreanu, however she adapted his teachings into her own personal style. She is known to be the aggressive type of player, always pushing her opponents to make tough choices. Ng is the kind of player that prefers to lose it all in an all-out attack, rather than lose slowly. This style of playing is probably why she has yet to win a big time tournament, yet. Although she has not been able to get a victory while playing at the WSOP, she has been able to get 10 money finishes. While playing at the WPT, she has been able to get to 1 final table and has had 4 money finishes. 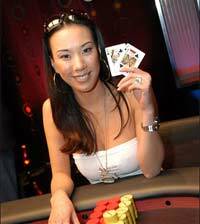 All in all, her total live tournament winnings as of 2010 were of over $375,000. She still has a lot of work to do, but everyone has faith that she will earn her titles and bracelets any time soon.